Welcome to the easiest frozen treat of your life, outside of buying one. 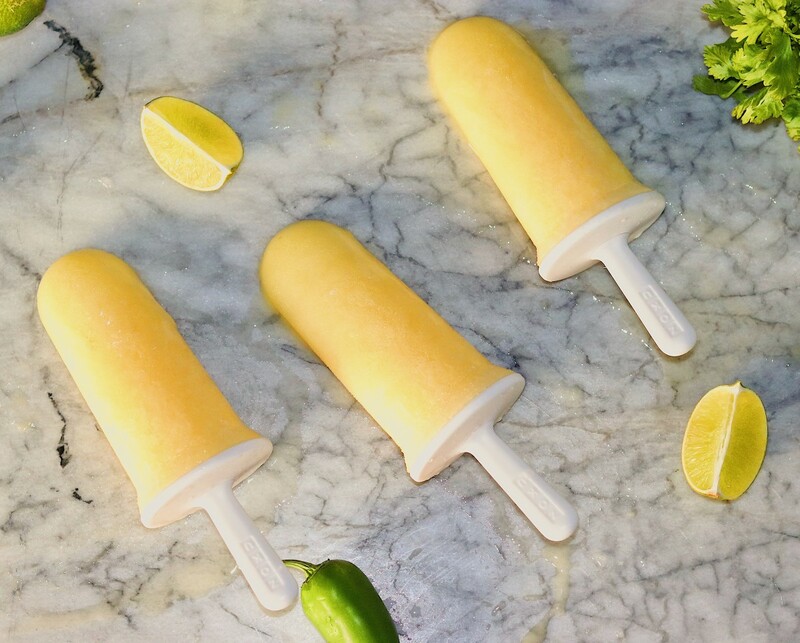 Pineapple Popsicles, ya’ll. They’re totally customizable which is awesome and also have none of that fake stuff like normal popsicles. By that I mean, they contain real fruit, duh. I made these with frozen pineapple and a little simple syrup. I added some coconut yogurt to a few for fun, some lime juice to others, but feel free do do your own thing. Are you a spicy guy or gal? If so, throw in some jalapeño. Do you like more of the creamy texture? Add in more dairy-free yogurt. Are you one of the people that has the “weird” cilantro gene which makes you love it to death, like me? Excellent! Add that in for fun, too. For my popsicles, I used popsicle molds. You can find them pretty much anywhere. However, when I was a kid, we had the ice cube trays that you fill with water, let freeze, then empty and refill. You know what I’m talking about, right? If you have those, blend this up and throw this mixture in there and when they’re getting solid enough to hold a popsicle stick, shove one of those in there. Bam, pineapple ice cubes on a popsicle stick. Speaking of flavored ice cubes, I’ve got some friends who are pregnant currently and are always looking for a good mocktail recipe. Why not throw this mixture into some ice cube trays and then blend it into a flavorful, delicious, icy beverage? After all, summer doesn’t OFFICIALLY end until the end of September. Do you have mint in your garden or your fridge? This could be another delicious addition. Let’s get to how I did this, shall we? Grab some pineapple, fresh or frozen work here and then make a simple syrup. To do that, combine equal parts water and sugar in a sauce pan and heat until the sugar is dissolved. The water will be more “syrupy”. Take about 10oz of pineapple and throw it in a blender. If using fresh, make sure you peel it and throw in just the edible fruit part. This probably goes without saying, but I want to be VERY clear that you don’t just cut a whole pineapple in half and throw it in a blender. That’s no bueno. To that, add about 1/2 cup of simple syrup. Blend on high speed until its smooth and combined. Give her a taste. If you want it sweeter, add more syrup. If you want it less sweet and more pineapple flavor, add more pineapple. This is all to your liking and how you want your popsicles to taste. I’m just giving you the method. Once you get the flavors how you want it. Pour into popsicle molds or make your own popsicles in ice cube trays. Freeze for a few hours and then enjoy! There isn’t much better than a super ripe fresh pineapple in my opinion. This is just the frozen treat version. I hope you all love this simple recipe. The customization really lets you get creative in the kitchen. Try it with other fruits, too! If you make these, be sure to take me on Facebook and Instagram @plantiful_grub. I’d love to see your creations! Enjoy! The easiest 2 ingredient summer treat that's totally customizable and a fun way to get another serving of fruit in your body. Start by making the simple syrup. Combine the sugar and water in a sauce pan over medium heat. Heat until the sugar is dissolved and forms a syrup. About 5 minutes. Place the pineapple in high speed blender followed by some simple syrup. Blend on high. Taste and adjust how you prefer. This is a great time to add ingredients if you want to change the flavor profile. Pour into popsicle molds and freeze for at least 3 hours. Enjoy!